Let's Do It for ME! : MANY HAPPY RETURNS: A HUGE THANK YOU! MANY HAPPY RETURNS: A HUGE THANK YOU! "We'd like to take the opportunity to say a huge thank you to everyone who supported last year's Bernice Summerfield story Many Happy Returns, the celebratory release featuring a wealth of talent in front of and behind the camera. 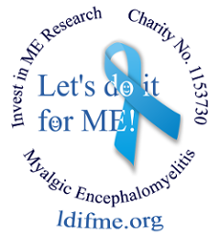 It's so far raised £4454 for the charity Invest in M.E. And it's still on sale!" A feature-length tale, it's written by Xanna Eve Chown, Stephen Cole, Paul Cornell, Stephen Fewell, Simon Guerrier, Scott Handcock, Rebecca Levene, Jacqueline Rayner, Justin Richards, Miles Richardson, Eddie Robson and Dave Stone and stars, amongst others, Lisa Bowerman, Stephen Fewell, Ayesha Antoine, Miles Richardson, Katy Manning, Nicholas Briggs, Sylvester McCoy and Sophie Aldred. "Great news. Having M.E myself, it would be great to see some breakthrough medically . Well Done Big Finish !" "Amazing! Thanks again to everyone involved in this and being so generous in giving the proceeds to charity x"
"This was a truly amazing release. The scenes with Benny and Jason at the end literally had me sobbing my heart out. This is how to do an anniversary story, Doctor Who producers, I hope you've taken notes." "I cried my eyes out as well at the end! Well done! Good story.. great characters and a good cause! How about another one next year!!" "Congrats on money well raised." "This is quite an amazing achievement on top of what Scott already raised with his marathon running. It is a privilege to be supported by such generous people like Scott and his colleagues". Many Happy Returns featured in an article in BBC Dr. Who magazine in October - you can see it on our website here - and you can see photos of Let's do it for ME Bear meeting some of the wonderful writers and cast in the photo gallery here. 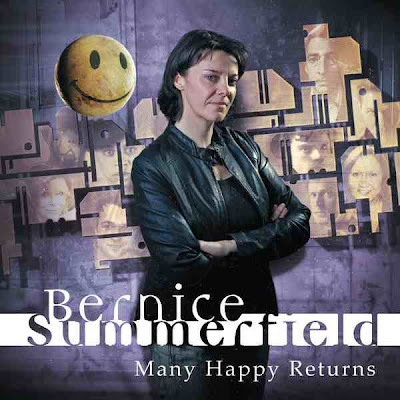 Bernice Summerfield: Many Happy Returns is available on the Big Finish website. A huge thank you to everyone involved in this production and to all supporting it! Justyce Served - A Small Start with a Big Finish - a book by Alun Harris and Matt West about the early days of Audio Visuals: Audio Adventures in Time & Space - the majority of the creative team went on to be involved with Big Finish. The authors' profits from this book will be donated to Amnesty International and Invest in ME. Running To Stand Still - an audio play about M.E. written by Barnaby Eaton-Jones. March 2012: Big Finish Helps Our Big Cause! December 2012: Bernice Summerfield: Many Happy Returns Out Now! The Big Sleep for M.E. is back for 2013! Small charity - BIG Cause - Big Break!